Famous camp for kids orders more comprehensive testing for contamination. The owners of a famous camp for kids and religious retreat center outside LA say they’ll do "more comprehensive" testing to check for contamination on their 2,800-acre property. The campus sits next door to the Santa Susana Field Lab, where rocket and nuclear testing and experimentation were done for decades. The announcement comes in the wake of an NBC4 I-Team report investigating concerns raised by former senior staff members, campers and parents that thousands of children and adults at the Brandeis-Bardin Institute, and its "Camp Alonim" might have been exposed to chemical and radioactive contamination. And it comes in the wake of at least two organizations canceling youth retreats at Brandeis and moving them to other locations. 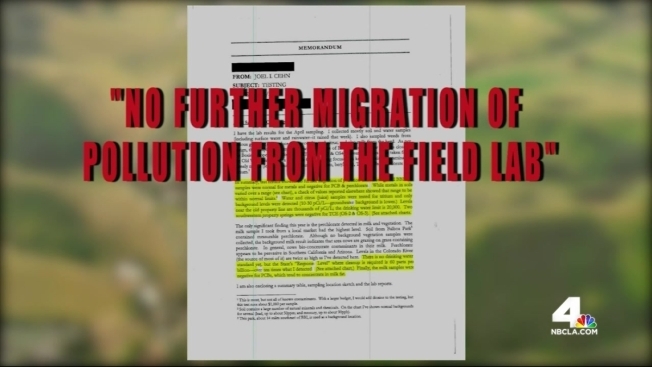 The owners of the property, the American Jewish University (AJU), announced the additional environmental testing after learning that NBC4 was about to air another report, revealing that contamination was discovered by the camp’s founder as early as 1957. "It’s shocking to learn about all this now," Erwin Sokol told NBC4. Sokol was a counselor at Camp Alonim in the 1950s, his wife Caren then sat on the Institute’s board of directors in the 1990s, and the couple have donated money to and been honored by Brandeis. Brandeis owners have said in numerous recent statements their camp "is safe for campers, staff, and visitors." Other statements have said there’s been "no cause for concern about the health of campers, staff and visitors… in the past or present." But the I-Team obtained documents that show the camp's founder, Dr. Shlomo Bardin, was so concerned in 1957 about "discolored water" flowing from Santa Susana to Brandeis that he called the Sheriff. Brandeis' lawyer at the time, Arthur Greenberg, wrote to the owners of the Field Lab in October 1957 saying the Field Lab "caused and permitted great quantities of waste material to be carried down a stream running through Brandeis Camp" and that "this unlawful pollution of said stream endangers the camp water supply and the health of hundreds of children and adults who regularly use its facilities." The lab's owner at the time, Rocketdyne, found the contamination was coming from a plant at the lab, and suspected that the chemicals spilling into Brandeis' stream were potentially toxic sodium hydroxide and hydrocarbons. Rocketdyne’s assessment was that the "discolored water" spilling into Brandeis was "not poisonous for human consumption, although it is probably capable of destroying vegetation and, if consumed by animals, might cause intestinal disorder." Dr. Bardin insisted that Rocketdyne stop the pollution. "Dr. Bardin was shocked at the time," says Brandeis alum Erwin Sokol, after the I-Team showed him the 1957 documents we uncovered. "He didn’t cover it up. He exposed it right away," Sokol added. In recent decades, more contamination from the Santa Susana lab has been found on Brandeis land and water. Tests in 1991 done by Rocketdyne found toxic TCE in groundwater at Brandeis; 2003 tests done by the state on a Brandeis well found toxic Perchlorate; and in 2004, a test Brandeis commissioned found perchlorate in milk from a cow on the property, both above the state’s standard for drinking water. AJU asserts the water and milk were not used for drinking. Brandeis’ owners, the AJU, told NBC4 there have been routine tests on their property "for over twenty years." In other recent public statements, the AJU has said "groundwater is tested multiple times each year" and "soils, milk and agriculture are tested periodically." The I-Team asked the AJU to let us see all tests conducted by Brandeis to check for contamination that have ever been done on its property. The AJU emailed us memos summarizing tests that their consultant had performed on eight occasions, an EPA fact sheet about radiation contamination found on property previously owned by Brandeis, a fact sheet about perchlorate contamination on their property, and a Boeing (SSFL’s current owner) Environmental Report from 2005. But for the last 24 years, the AJU didn’t give us any test data it commissioned for 16 of those years. "It looks much more like they have a minimal testing program so they can say they’ve done it," said Dan Hirsch, head of the Program on Environmental and Nuclear Policy at UC Santa Cruz, who also attended Brandeis retreats as a college student in 1970, and has fought for a full cleanup of the Field Lab. Hirsch, who has reviewed environmental tests for government officials, agreed to review test data that Brandeis/AJU gave to NBC4. The AJU gave us a summary for tests done in 1996, but then there is a ten year gap in testing data provided. "Were there no measurements taken for an entire ten years?" Hirsch said. 2006 tests AJU gave us showed "no further migration of pollution from the field lab" to the camp area. But Hirsch noted that the tests — on mostly soil and water samples — only tested for nine out of the dozens of contaminants found uphill at the Santa Susana Field Lab. Brandeis’ own consultant says in the test summary, "With a larger budget I would add dioxins to the testing." Dioxins are one of the main contaminants found at the lab. The 2006 test summary also has a notation that tests were done in 2004, that found perchlorate in the milk of a cow at Brandeis. But the AJU did not provide NBC with the testing memo for 2004 that may have shown more detailed information. "What’s the reason they (AJU) haven’t provided the 2004 report?" Hirsch said. After reviewing the eight years of test summaries the AJU released, Hirsch said, "They gave NBC almost no testing information. Nothing that produces a conclusion that the site was safe." And families who spoke to NBC4 expressed concern about the limited number of testing reports provided by Brandeis and what appears to be the sporadic nature of the their testing. "You have to fill in all those years," said Sokol. "You really have to know what’s going on from 1957 up to the present." This week, the president of AJU, Dr. Robert Wexler, sent a letter to Brandeis families and donors, saying "We are commissioning more comprehensive tests with additional independent consultants. We fully expect that the results will reconfirm the safety of the property." Said UC’s Dan Hirsch, "That statement is troubling, because it sends a signal to the consultant about what results that Brandeis, which is paying the consultant, would like to get." The I-Team asked the AJU in an email, "Who will select the 'independent' consultants, and by what process will they be selected?" The AJU did not respond to our questions. In its letter to Brandeis families, the AJU’s Dr. Wexler also said "The Department of Toxic Substances Control (DTSC) is the state agency responsible for protecting residents from hazardous waste exposure." The AJU said "DTSC has reviewed the Brandeis testing data on a quarterly basis and has consistently found Brandeis-Bardin to be safe. On November 5, 2015 the agency confirmed the safety of the Brandeis site at a public workshop. Furthermore, the DTSC stated in writing on October 15, 2015: 'Based on available data, there is no evidence of contamination from SSFL that poses an off-site threat to human health or the environment.'" NBC4 asked the AJU to provide us a link to the DTSC’s review of Brandeis test data, but AJU didn’t respond. The I-Team also asked the DTSC, in an email, "Did the DTSC confirm the safety of the Brandeis property, and if so, how did the DTSC make that determination?" Three days later, the DTSC’s spokesman Russ Edmondson told NBC4 "I have not received information yet" to answer those questions. DTSC has a troubled history as a state agency, and some elected officials have questioned DTSC’s competency. The current DTSC director, Barbara Lee, is the tenth director at the agency in ten years. California Senate President pro Tempore Kevin de León, who chairs the committee that confirmed Director Lee, said during her confirmation hearing that "this is an agency that has been plagued historically with many irregularities, lack of clarity, a lack of uniform standards." He added, "This is an agency that is deeply, deeply in trouble." Linda Parks, a Ventura County supervisor who has worked with the DTSC in her efforts to get the Field Lab cleaned up, told NBC4 that the agency is "in need of major structural reform." And in 2013, a group of state lawmakers, including de León, demanded an independent review of the DTSC. Numerous Jewish organizations have considered canceling weekend youth retreats at the camp. The I-Team has confirmed that at least two groups have now canceled their retreats at Brandeis and moved them to other locations. The Diller Teen Fellows, a program for high school students to develop future leaders, moved a retreat last weekend from Brandeis to Camp Hess Kramer in Malibu. A letter to parents from the LA area coordinator of the Diller Teen Fellows cited "parent concerns" after NBC4's first report about Brandeis as one of the reasons they moved retreat to a new location. Scientists and elected officials are also raising new concerns that heavy El Niño rains, expected this winter, could wash contamination from the Santa Susana lab down to areas such as Brandeis. Ventura County Supervisor Linda Parks, whose district borders the field lab, is concerned that Boeing — the Field Lab’s current owner — doesn’t have sufficient measures in place to prevent contaminated rainwater from flowing off-site. Of special concern is "Outfall 9," a drainage or stream that flows from Santa Susana to Brandeis. "If they don’t have any contingency plans for El Niño, hopefully they put some together," Parks told NBC4. NBC4 asked Boeing for comment, but they elected not to comment. Concerns about El Niño were also raised by Dr. Yoram Cohen of UCLA, who lead a 2006 federally-funded study about off-site contamination from Santa Susana. "If there’s significant rain in the area, I’d be concerned about contaminants moving into the groundwater and moving off-site at that point," Dr. Cohen said. NBC4 again asked The American Jewish University to talk to us for this report, at a time and place of their choosing. They didn’t respond to that request. AJU did email us a statement saying "we conduct regular testing and have evaluated years of government tests and reports related to our site." The statement also said "We have no information, including what has been shared in KNBC's reports that cause use to reach any different conclusion about the Brandeis-Bardin property. It is safe for campers, staff and visitors." You can read the AJU’s full statement to NBC4 here.